So, we have been kicking around the idea of a custom photo puzzle of us for some time. Tonight, we went through our photos and spent some time creating it! 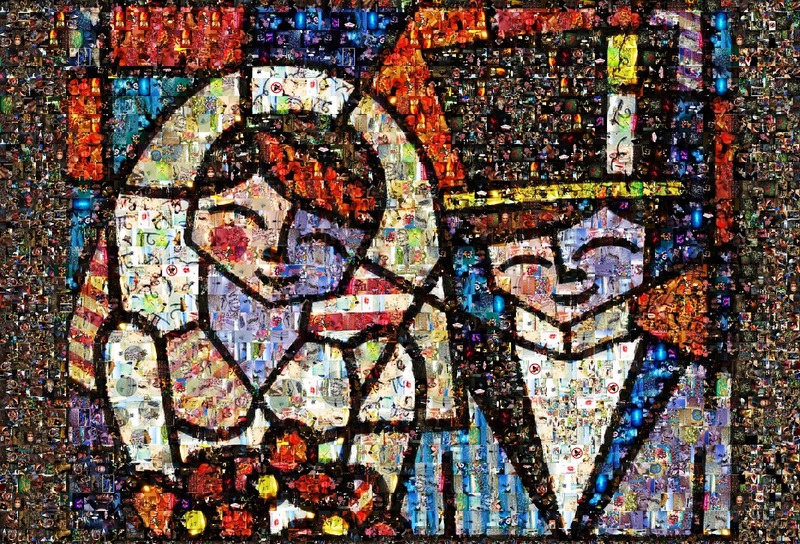 Its a photo mosaic of a Britto Painting titled Bride and Groom. It consists of 2618 tiles from 209 images of our crazy life together. Here it is, we will let you know how it goes. We are hoping the folks over at http://www.mypersonalpuzzle.com/ will build it for us. We have reached out to them and they have indicated they can build a custom 6000 piece version! Check out their site! They are located right here in Indiana They make about 50,000 puzzles a day and chances are since you are reading this blog, you have assembled one of their puzzles and don't even know it! You may be interested in the software we used to make this puzzle. It was a two step process involving the mosaic software and photoshop. The mosaic software is Andrea Mosaic. It is free software and does an amazing job! We created the 210megapixel mosaic with no coloring to force the software to perform the best "fit" of the tiles. We then took the exported image into Photoshop and overlaid the original artwork as an "overlay" layer and set the opacity to 70%. This provided the richest color and the strongest images. Feel free to contact me if you want help making your own. And this is an interactive "map" of the image. Double click to zoom in and click and drag to move around. It is rather large; we plan on getting a 6000 piece version (A big boy for sure) so each image will be about 3 pieces. The actual puzzle will be 62.5in x 42.5in. This is going to be one seriously difficult puzzle! OMG! That is the coolest thing I have ever seen! How did you guys do that? Is there some sort of app that lets you color the pictures a certain tint to make the image properly? Does it automatically turn the pictures upside down or sideways in order to make the pattern look right? I'm in awe...that is really the best looking mosaic I've ever seen! When are you getting it made, and by which puzzle company? Sorry, I am full of questions, but this is AWESOME looking. I would love to do something like that with all of Derek's baby pictures. How fun! This new image looks great. The colors look true and vibrant. I love it. Even before seeing the "map", I can tell this one is going to be a lot better. I checked out the custom puzzle webstie too. Looks like a match made in heaven between the mosaic software and this place to get the puzzle actually made. Woo hoo! I gotta make sure my images are going to be high enough resolution that when the mosaic picture is spread out over a 1,000 pieces puzzle, it doesn't come out grainy. Just saw the latest version of the mosaic puzzle. It looks great. Coloring is much better now. I love it. You said you guys are going to get it in a 6,000 piece version, right? It will be beautiful. You will have to find a great place of honor to put that one. It will become priceless to you guys.